THE NEW FOOD COLLECTIVE brand sources meat from small farms in Georgia, Kentucky and Missouri that use regenerative agricultural practices. 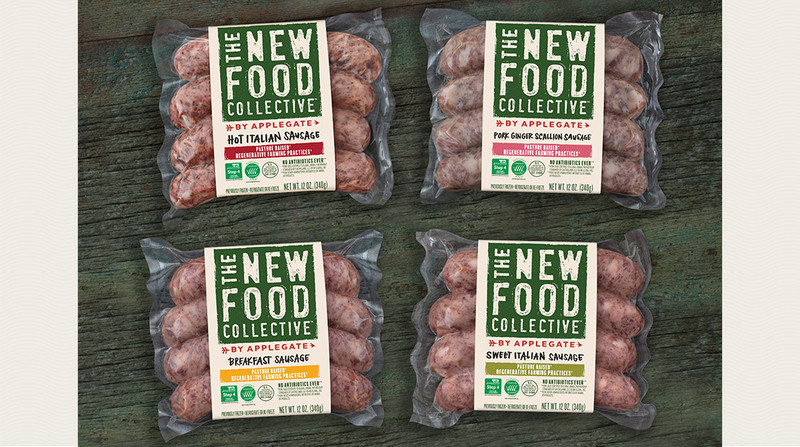 Applegate Farms, LLC, Bridgewater, N.J., announced THE NEW FOOD COLLECTIVE, a new premium brand that uses pasture-raised meats and small-batch production methods to create culinary-inspired products. The launch features a line of fresh sausages that are said to be the first pork to be certified by the American Grassfed Association (AGA), Denver, Colo. THE NEW FOOD COLLECTIVE brand sources meat from small farms in Georgia, Kentucky and Missouri that use regenerative agricultural practices, which are designed to improve soil, water retention and biodiversity. Applegate is also working with the Savory Institute, Boulder, Colo., to assess farm practices and create proof-of-impact metrics that can be shared with the public.